The TJNL celebration continues! Scoot on over to Pat's blog and enter today's contest. While your there wish her a Happy Birthday! 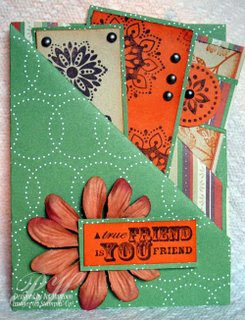 Today's give away - The winner of today's giveaway will receive a card a week from Pat for one full year. Yes, you read that right. If you win, you will receive 52 cards....one card a week for the next 52 weeks. How is that for a celebration? Pat's starting with the card shown. You can enter this giveaway by going to Pat's Blog and leave a comment.